Dr. Kamala Sohonie was the first Indian woman to receive a Doctorate degree in a scientific discipline in the United Kingdom from Cambridge University. (It has also been reported that she was the first Indian woman to receive a doctorate in general). She was also a trailblazer for women’s admission to the Indian Institute of Science (IISc). 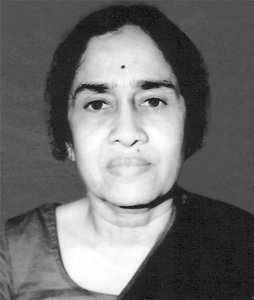 Dr. Kamala Sohonie was born in 1912 in India. Both her father and uncle were chemists and she followed suit. She graduated top of her class in the 1930s with a Bachelor’s degree in Chemistry and Physics. However, despite this, she was not initially accepted into a Master’s program at (what is now called) the Indian Institute of Science. The director at the time, nobel laurate Dr. CV Raman, refused her entrance solely based on her gender. She fought this decision until Dr. Raman gave her conditional admission for one year. Due to her excellent work in the program, he allowed her to complete her studies and began granting women admission to the IISc in 1930s. Following her Master’s work, looking at the proteins in milk and legumes, Dr. Sohonie was awarded a scholarship to complete her PhD at Cambridge University. This is where she discovered the enzyme ‘ cyctochrome C’ in plants which plays an important role in the electron transport chain (for energy generation) in plants, animals and humans. She completed her degree in 14 months which was and is, especially today, a great feat. and “neera” a drink derived from a palm tree. She found that neera contained vitamins A and C and iron and could be used as a cheap dietary supplement for the poor and malnourished. Dr. Sohonie’s work led to her winning the prestigious National Award for Excellence and Contribution to Science in 1997. She passed away one year later at the age of 86. Not only was she a trailblazer for women, but her contributions to science through her research led to large humanitarian impacts for the poor and malnourished. used biology and engineering techniques to improve islet transplantation for type 1 diabetes. media. You can find her on Instagram, twitter and facebook. Interested in writing a historical femme feature for the Femmes of STEM blog? Send us a submission!